I love mixed-up fairy tales and today’s feature is a fun one! For writers, it shows how effective it can be to put a new, creative twist on a classic story. As a teacher, I know this story with its comic-style illustrations will really hold student interest in a read aloud. 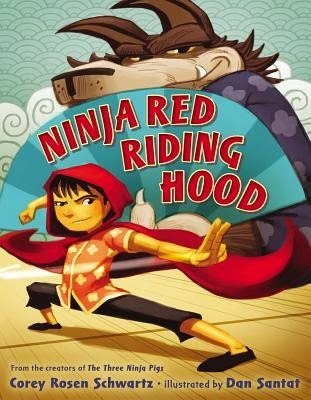 Ninja Red Riding Hood by Corey Rosen Schwartz and Dan Santat was first published in 2014 by G.P. Putnam’s Sons, New York. Check out this fun trailer. This story incorporates the rhyme so seamlessly it’s a great one to study if you’re taking on the challenge of writing in rhyme. The concept of this story—re-envisioning the original with Ninja’s—is an impressive hook. It’s worth reading this story a few times to study how the author wove the concept through all aspects of the story. The story is also a great model for pacing and effective page turns. This would be a good story for older primary students to read after reading and studying the classic version of Little Red Riding Hood. Students can look for similarities and differences. The colorful, comic-style illustrations are eye-catching, and offer an opportunity to explain speech bubbles. For classroom use, this story might require some discussion about whether fighting is the best way to solve problems, but it would be an engaging way to start. The ending might also require some discussion about respecting other people's choices and views (e.g., about vegetarianism). I’ve heard a lot about this book, so I’m glad I finally had a chance to read it. And it's a dog story! I love dog stories. I read this one as an e-book from my public library. Rose Howard is obsessed with homonyms. She’s thrilled that her own name is a homonym, and she purposely gave her dog Rain a name with two homonyms (Reign, Rein), which, according to Rose’s rules of homonyms, is very special. Not everyone understands Rose’s obsessions, her rules, and the other things that make her different – not her teachers, not other kids, and not her single father. When a storm hits their rural town, rivers overflow, the roads are flooded, and Rain goes missing. Rose’s father shouldn’t have let Rain out. Now Rose has to find her dog, even if it means leaving her routines and safe places to search. I’ve read several middle grade books about kids with autism now, but even so I still enjoyed this one. At the beginning, I was a tiny bit annoyed by Rose’s frequent homonym mentions, but I appreciated how they brought out her personality and drew the reader in to the way she thinks. I liked the fact that her father seemed to be struggling with how to interact with her too, and wasn’t portrayed as super-supportive or having all the answers. It was an emotional story and though sad in places, I was left feeling hopeful for Rose. As a writer, I thought the ending was interesting. Everything wasn’t wrapped up to be neat and tidy with everything happily ever after. It left me wondering about the characters and what would happen next, not in a “setting up a sequel kind of way”, but in just thinking about what might happen. Ann M. Martin lives in the Hudson Valley in New York state with her cats. 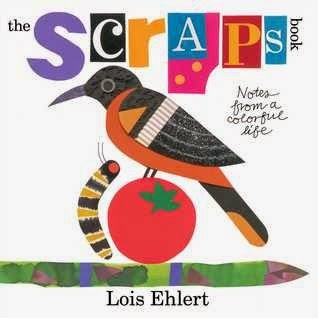 She has been a children’s book author since 1983. She is well-known for writing The Baby-sitters Club series. 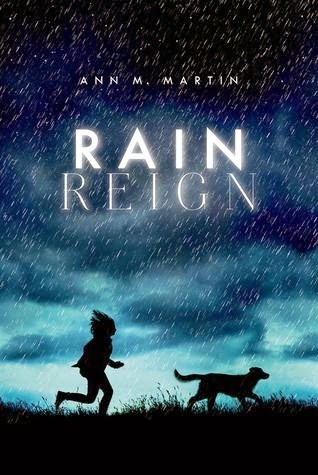 On TeachingBooks.net, Ann M. Martin talks about how Rain Reign came to be. For a list of her many published books, visit Ann M. Martin at the Scholastic website. You can learn more about Ann M. Martin on her Facebook page. As a middle school “dork” myself, I often choose middle grade books where the dorky kid finds a place for themselves. This one was interesting because the main character had a new baby sister with a disability. I read it as an e-book from my public library. Lucy knows that kissing Tom Lemmings behind the ball shed will make her a legend. But she doesn’t count on that quick clap of lips propelling her from coolest to lamest fourth grader overnight. Suddenly Lucy finds herself trapped in Dorkdom, where a diamond ring turns your finger green, where the boy you kiss hates you three days later, where your best friend laughs as you cry, where parents seem to stop liking you, and where baby sisters are born different. 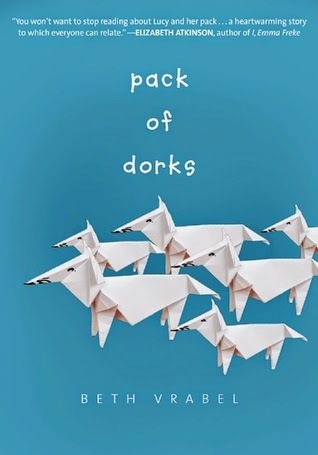 Weaving tough issues, including bullying, loyalty, and disability, with a thread of snarky humor, family bonds, and fresh perspective, Pack of Dorks paints characters coming-of-age and coming-to-terms. Beth Vrabel’s stellar debut contemporary middle grade novel is sure to please fans of Jack Gantos, Elizabeth Atkinson, and Judy Blume. Lucy has a lot of problems with kids at school, not to mention the problems that arrived when her new baby sister was born. I haven’t come across many middle grade books where the main character has to deal with a sibling having Down Syndrome. Lucy's behaviour and actions seemed realistic for her age and I was rooting for her to find a way to solve her social problems and fit in. I especially liked her unconventional grandmother, and learning about wolves and the wolf sanctuary. From a writer’s perspective, it was interesting to think about how the author stayed true to Lucy’s point of view, by having her more concerned and aware of problems with her friends than the issues related to her new sister, which were consuming her parents. Beth Vrabel lives in Connecticut, and once wanted to be a wolf biologist. Her next book, The Blind Guide to Stinkville is coming in the fall of 2015. For more, visit Beth Vrabel’s website. I’m hooked on Master Chef, Master Chef Junior and The Taste, so to anyone who knows me, it’s not going to be a big surprise that I really loved this food-related middle grade book! I waited for a long time for it to become available at my public library, and finally got to read the e-book. But I think I might buy a copy of my own. This story was a lot of fun! I heard many good things about this book before I read it, and it definitely lived up to my expectations. I really liked the concept of an 11-year-old girl secretly becoming a restaurant critic. Gladys’ parents were interesting characters, seemingly very different from her (they were hopeless at cooking) and although they did spend a lot of time at work, there was a strong sense of family. I also liked Gladys’ attempts to solve her problem of how to actually get to the restaurant she was supposed to review. This book has interesting settings (food shop, Broadway show) and humor with all the difficulties that Gladys encountered with her friends. As a writer, I’d study the plot in this story, as well as the pacing. The story moves along quickly, so there were no slow or dull moments. Each scene is important to the story. 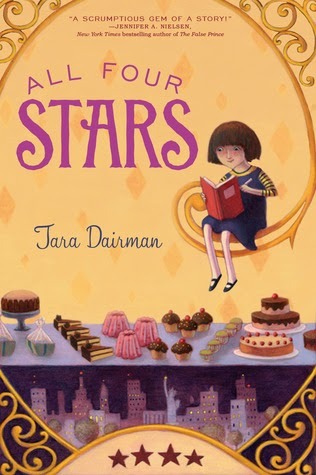 Tara Dairman lives in Colorado, where writes plays and middle grade novels. She enjoys traveling and spent two years traveling around the world. A sequel to All Four Stars, called The Stars of Summer, is coming in May of 2015. I can hardly wait! All Four Stars is a finalist for the Cybils Awards, in the category Middle Grade Fiction. Tara offers a free 20-minute author Q&A session on Skype or Google Hangout with any class, book club, or library group that has read All Four Stars. For more, visit Tara Dairman’s website. This was the first year since I started my 100 book challenge that I didn't achieve my goal of reading 100 MG and YA books. I know that sounds like something I should be disappointed about, but I'm not. The main reason I set goals is for something to work towards and to focus on. I can always set another one or a different one if that one doesn't work out. I like to be flexible. I still strongly believe that reading a lot of books is an important way to improve your writing. But the other important thing that goes along with that is actually doing the writing. And in 2014, I was writing. I also re-discovered my passion for writing picture books, which I gave up a few years ago because of the frustration of rejection. This year, I'm ignoring that and doing what I love. Besides, almost every day I come home from work with another picture book idea (one of the benefits of teaching kindergarten). I'll still be working on my middle grade novels, too, because I love the ideas and challenge. What does this mean for my reading goals? This year, I'm going to be changing my 100 Book Challenge to include picture books as well as middle grade novels, and a sprinkling of young adult novels because I love them too. I'm not setting a number for how many of each type, because I like to see what I find. I choose books to read based on recommendations from other readers and writers, as well as from what I find in my local library. If you have any recommendations for me this year, please share them in the comments! 1. Read 100 children's books - picture books, middle grade and young adult. 2. Read all of the picture book and middle grade fiction finalists for the Cybils Awards, and maybe some of the finalists for speculative fiction for elementary and middle grades, if I have time. (For more about these awards given by book bloggers, visit www.cybils.com). 3. Read all of the Blue Spruce and Silver Birch nominees from the Ontario Library Association's Forest of Reading. I'm so excited to begin! I already read a couple of the nominees and finalists towards the end of 2014, so I'm off to a good start. Do you have any reading goals? Feel free to share or link to them in the comments. I'll be back Thursday with a Learning from Picture Books feature and then next Monday I'll have my first featured post for Marvelous Middle Grade Monday in 2015. Happy reading!